French-milled soaps, plants, perfumed lotions, Egyptian cotton towels—these are a few of your favorite things. Surround yourself with them without creating clutter by designating display spaces in your bathroom for the pretty stuff and tucking away the rest. 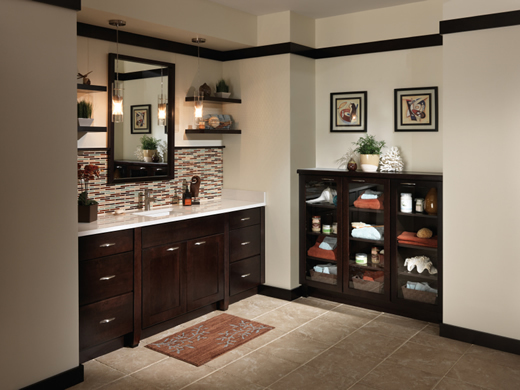 Glass doors on bathroom cabinets, floating shelves, and drawer organizers provide the best of both worlds. They’re shown here in Classic Tolani in Maple Kona, paired with a Quartz bathroom countertop and Delta® faucet. Click on the dot to view details of each bathroom storage accessory.